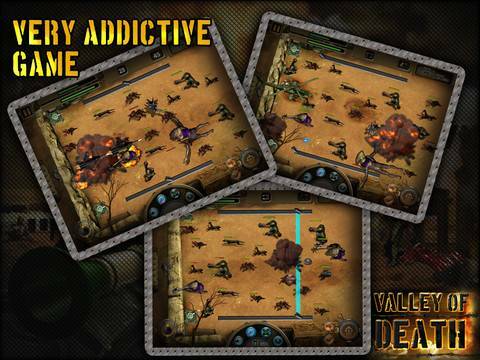 Valley of Death HD for iPad is a decent enough action game that plays a little like a horizontal version of BattleBow, but with more of an emphasis on action. 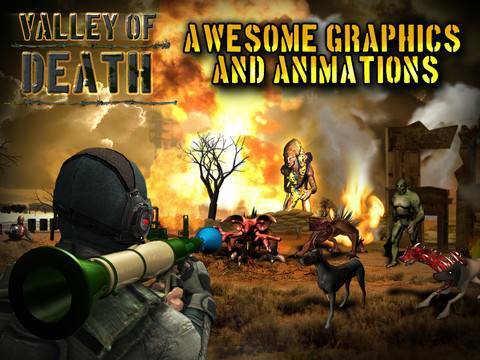 That is no bad thing at all, as I loved BattleBow, and to tell the truth, there is a lot that I like about Valley of Death HD. The game plays well enough, with a great feeling of actually hitting the enemy with your bullets. This is achieved with some nifty sound effects and the way the bullets actually hit the enemy sprites. This simple thing is what so many shooters get so wrong- that feeling of ‘oomph’. 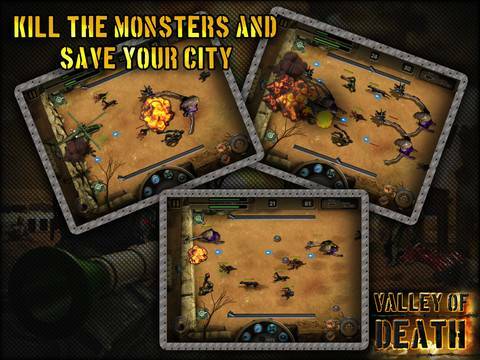 The aim of the game is to simply defend your wall against an endless wave of enemy attack. You can move up and down the wall freely, with a joystick on the left for movement and a button on the right to fire. 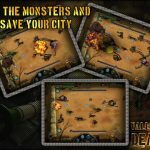 There are also a variety of power-ups to buy and charge up that you can use, as well as a lot of different primary and secondary weapons to use, and believe me you will need to master most of them when things start to get frantic. 4.10 Primary weapons such as Sniper, AK47, Apache, Bazooka, Grenade, M4 etc including 2 air strikes. 2.Call for bomber to destroy all monsters on the screen in one shot. There is full Game Center integration, and the ability to unlock new gadgets by completing surveys etc, which is a little better than IAPs in my opinion. I have, however, found a pretty large bug during my time with the game, and it seems to rear its head with every new game session. If you are shooting and, while still shooting, move your character down so that your bullets are in line with an enemy, the bullets pass right by the creature, leaving it free to attack your wall. If you move into position before you start shooting, everything works fine. I deleted/ reinstalled twice and even tried on another iPad, but the problem still arose. It isn’t a deal-breaker, but it is a bug that I hope the developer squashes quickly, as it has affected the score below. I will let you know when the problem is fixed. Overall, despite the bug, I really enjoyed this one. Something about the meaty feel of the game just kept me coming back, and the crazy upgrades you get later on are worth the slog to get there. 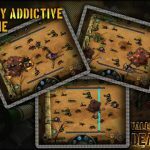 With fairly good graphics and sound, and a good addictive nature, Valley of Death HD does come with a recommendation for anyone looking for a simple but satisfying shooter, although you will need to watch for that bug.